The beauty of Manoa Valley and the Manoa Falls hiking trail are no secret. Much lesser known is an old Hawaiian legend about the area. Improvements and maintenance to the trail have greatly increased the trail’s accessibility over the year. The 150-foot waterfall is only about a 20-minute walk from the trail head, and a series winding other trails take more serious hikers all the way to the soaring twin peaks that tower over Manoa Falls. Those peaks figure prominently in the legend of Princess Kahalaopuna. With deceit, betrayal, and murder, the legend is a sprawling tale that begins in Manoa, and meanders all over Oahu before returning tragically to Manoa. Kahalaopuna was the beautiful daughter of set twin brother and sister (they didn’t know they were twins), commonly thought of as the spirits of Manoa’s famous wind and rain. Word of the princess’s spectacular beauty spread far and wide, ultimately reaching the ears of two chiefs who were disfigured by an eye disease. Hearing of her beauty without ever seeing Kahalaopuna, both men fell in love with her. They boasted of winning her affections during surf activities in Waikiki, attended by chiefs from all over the island. Kahalaopuna was betrothed to a chief from Kailua, Kauhi. He heard the false stories of the two chiefs and believed them. He vowed to end the princess’s life for her imagined betrayal. He took her for a long walk during which he killed her and buried her body. An owl, or pueo, which was Kahalopua’s guardian spirit, saw it happen. It dug down to her body and restored her to life. 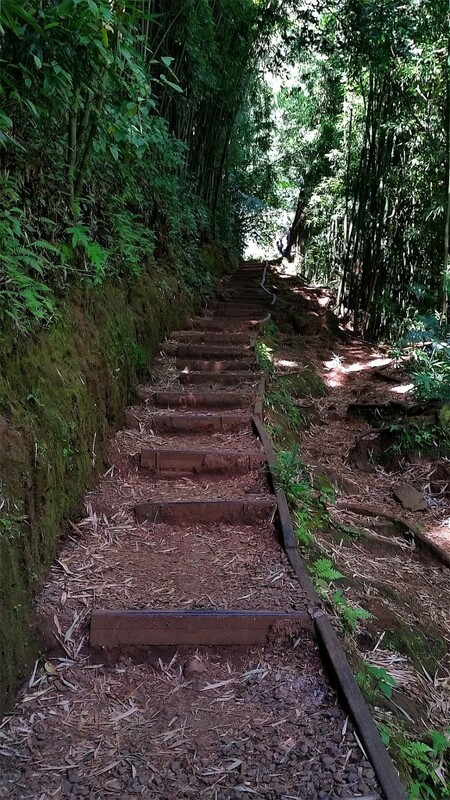 The trail to Manoa Falls, where the spirit of Princess Kahalaopua resides. Kauhi heard her songs of lament and forced her to walk all over Oahu. He killed her again, only to have the owl restore her to life again and again after each time he killed and buried the princess. Finally, the treachery of the two men’s lies and Kauhi’s cruelty were discovered. The King ordered that each of the three chiefs be killed for their lies and cruelty. They were burned and buried with their retinue in a fire pit or imu. The two lying chiefs were transformed by the power of family spirits into the twin peaks of Manoa Valley. A tidal wave sent by a shark spirit that night swept the body of Kauhi into the sea, where he and his subjects were turned into sharks. Thus, the princess was forbidden to enter the water, lest Kauhi’s shark spirit take its revenge on her. But one night she slipped away to enjoy the surf in Waikiki, where she was taken by Kauhi. Her company gave chase, but Kauhi ultimately ate her, assuring that she could never again be brought back to life. Upon hearing of their daughter’s end, Kahalaopua’s parents gave up their earthly bodies and returned to their spirit forms. These are the winds and rains that make Manoa Valley the lush, vibrant place it is today and a favorite destination for visitors and residents alike. So, if you find yourself hiking in Manoa, remember the legend of the tragic figure of Princess Kahalaopua. Her spirit is said to be seen in the whispering mists of Manoa Falls.